Two grower supported farmers markets got local press this month. Upper Eastside Farmers Market and South Miami Farmers Market have each been written up in the area’s free weekly papers. 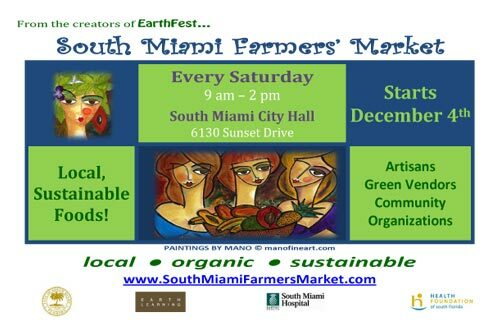 The Miami New Times picked South Miami as the best farmer’s market of 2011 in their Best of Miami issue that came out this week. The Biscayne Times ran a cover story on Upper Eastside in its June edition. Not bad for two little markets that burst upon the scene just this past winter! Both markets will be open through the summer, so go take a look at what’s growing now and good to eat! By the way, I’ve discovered that both markets will accept your compost. Save your fruit peels, vegetable trimmings, juicer pulp and coffee grounds in a bag in the freezer, then drop it off at market. (For an urban condo dweller like me, without a yard to dig around in, this is a great way to make sure that my uncooked food scraps get turned into compost.) At Upper Eastside, give your green gold to Art. At South Miami, they have a convenient collection bin. There are a few new farmers markets, and one returning market, opening up soon. Here’s a quick rundown of all-local, grower supported markets.